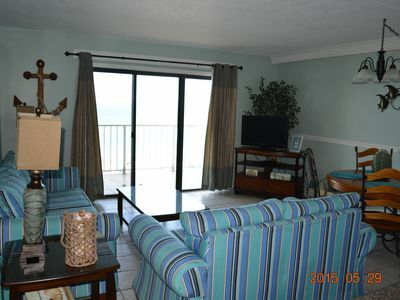 Tropical Breeze at Edgewater,walk to Pier and Shipwreck, 4th floor beach front! "Tropical Breeze" at Edgewater Beach Resort is a perfect accommodation for great family and friend trips to the "world's most beautiful beach". 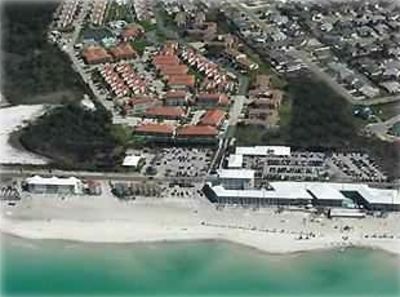 All the wonderful Edgewater Beach resort, still the only complete resort, on the beach are yours to enjoy when you're a guest staying in "Tropical Breeze" This means you have access to Edgies an ice cream and sandwich shop, a Pizza Hut and a fine full service lunch and dinner restaurant plus room service without ever leaving the resort. For a spectacular fine dining experience, make a reservation and simply cross the street for an award winning dinner at Firefly. After dinner, while still on that side of the road, you can walk a few more yards and enjoy Black light bowling, shooting pool under neon lights or even a few trips around the indoor roller rink. 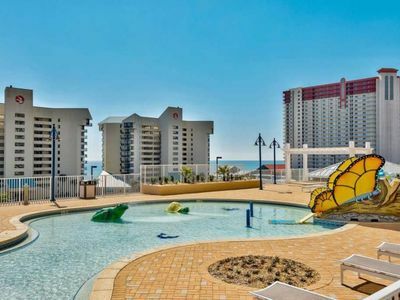 Back on the main grounds of the resort, you'll find you have welcome access to more than a dozen pools including the largest beach front lagoon pool in NW Florida. There is also live entertainment and refreshing beverages, hair wrap, tie dye shirts and more available pool side at the Lagoon pool. There is a fee for the children's H2O playground but the smaller children to pre-teens seem to really enjoy it. 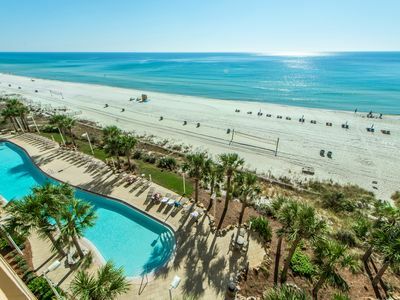 Tennis, Golf, a full regulation size indoor gym, a hair salon, masseuse, nail salon services and a wide variety of beach services, including rentals of sailing craft, skidoos and skim boards are also available without ever leaving the resort. 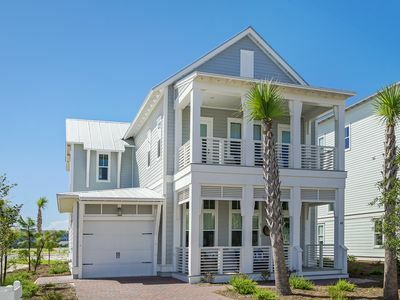 The location is also convenient to Panama City Beach Parkway, locals call it Back Beach, where you will find a Publix, Drug Store and several small specialty shops less than a mile from the resort. 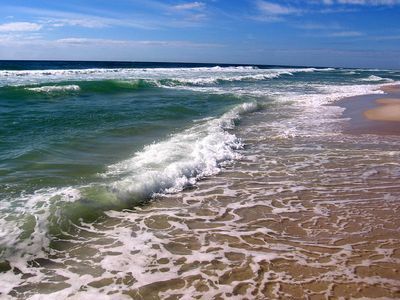 You can also easily get to Pier Park and Frank Brown Park straight west on Back Beach. This is easily a ten - fifteen minute trip with moderate traffic. 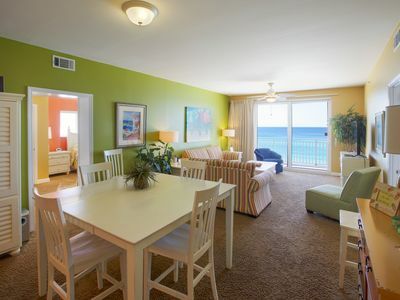 "Tropical Breeze" is a beautiful two bedroom condo on the 4th floor of the Leeward Building. Within the past 24 months, Tropical Breeze has undergone a major renovation including total replacement of all flooring with beautiful natural stone. 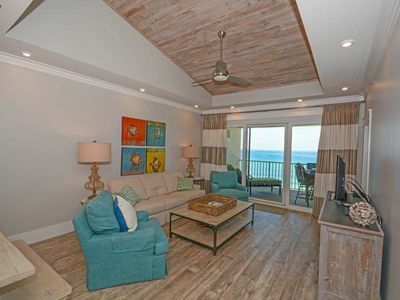 Painting throughout the unit to freshen and to update the décor in pleasing tones of vanilla that beautifully frame the glorious sparkling white sand and aqua Gulf of Mexico water that you have an unobstructed view of. The floor to ceiling glass spanning the entire south side of the condo plus the Alfresco dining ready balcony leave no doubt that the main appeal of Tropical Breeze is "The world's most beautiful beach." 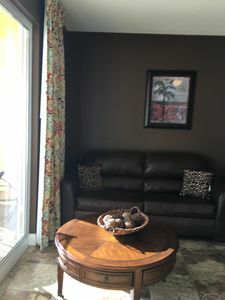 The new living room furniture, a reclining leather love seat, matching leather sofa with queen size sleeper sofa and a pair of leather recliners assure comfort and relaxation after a long day of playing in the sand and surf. There is a large flat screen television with blueray dvd, a stereo system. The dining room has a newly resurfaced, contemporary dining table, buffet and the breakfast bar. If the weather isn't perfect for alfresco dining on the balcony, you can move into the dining room and enjoy the views from more of that floor to ceiling wall of windows while breaking bread with family and friends. The kitchen is open and large enough for two to work together. You will find everything needed to prepare and serve some of your favorite recipes. Don't forget, with all the fresh seafood in the area you might enjoy creating your own coconut shrimp or broiled filets. There is a full size washer and dryer right off the main hall. The master suite, king size, is private and serene decorated in soothing shades of sea mist and foam. 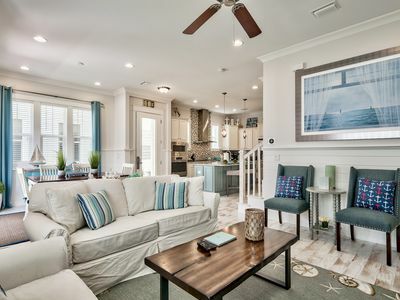 There is a flat screen television, a window to let in some natural light, indirect and task lighting, overhead ceiling fan, private bath with soaking tub. 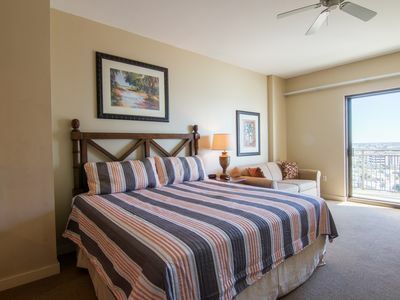 The second bedroom, with private access to the 2nd full bath (it may also be accessed from the hall) is furnished with a pair of twin size beds, double dresser, television and also has natural light source and an overhead fan. 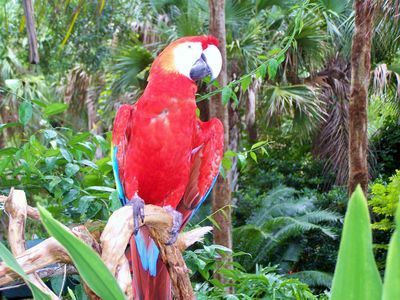 Tropical Breeze is close enough to the elevator to be convenient and far enough from it to be quiet. 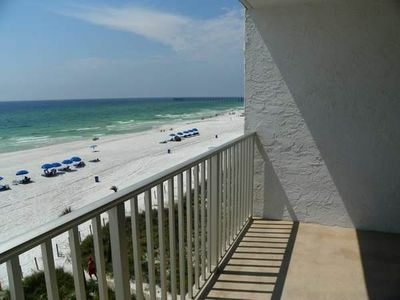 There is wifi service in the condo and being in the Leeward Building, it has a pool right beside the building an easy access walk onto the beach and a private gated exit directly onto Front Beach Road. 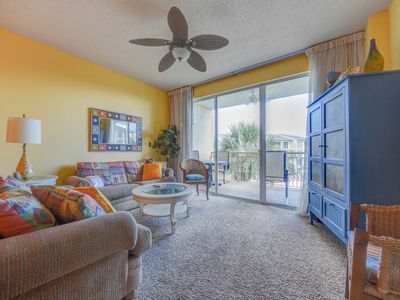 If you're looking for the ABC's of a great vacation or beach break, you will find it all at Tropical Breeze, Amenities, Beauty and Comfortable Convenience at a rate that won't break the bank. Make your reservation while you can. 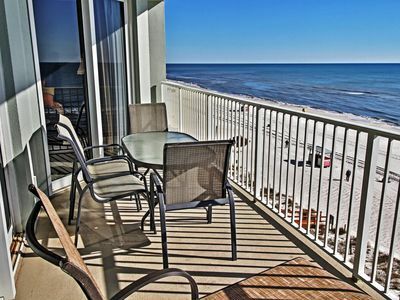 We're ready to say, "Welcome"
Breathtaking views from #E45 # High Pointe Beach Resort-includes Beach Service! 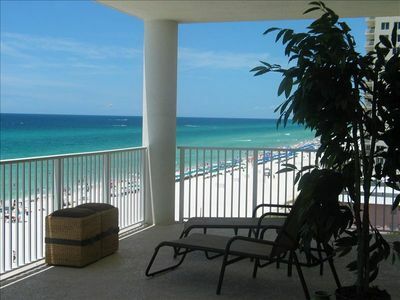 LaBarre Carriage House - Gulf View from the balcony!! 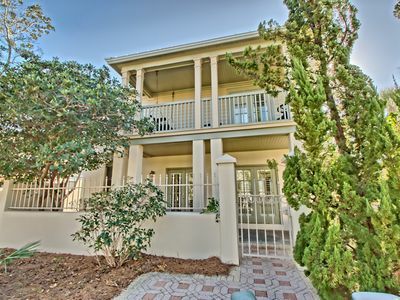 ☀BeachFRONT for 6☀Calypso 1-609 East-Beach SVC-BCHSide Pool! May 5 to 7 $727! RUM RUNNER! 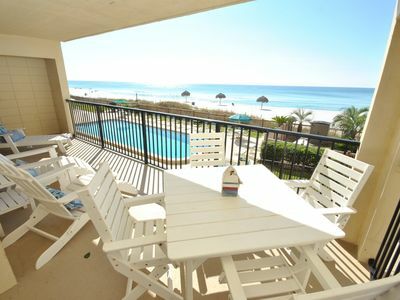 OPEN 4/20-27 ONLY $2517 TOTAL! BOOK ONLINE AND SAVE! 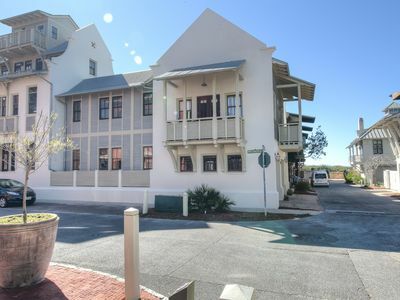 BEST DEAL IN TOWN...3 MINUTES WALK TO THE BEACH! 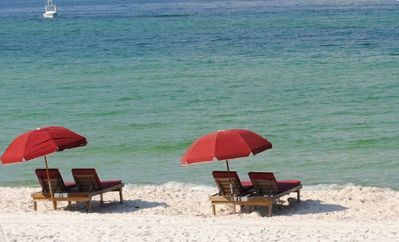 Panama City is the perfect Honeymooner's location!